Just recently charabancs and bus companies have featured quite a bit on this blog. Yesterday we featured a ‘lost and found’ button which may have belonged to Mr Fred Sayer. Today we bring you the history of motor bus operations as written by WI members in the mid 1950s. This also features Mr Fred Sayer. In 1911 the Bath Tramways Motor Company of Bath stationed two motor buses at Market Lavington, together with two drivers. The buses were garaged in the “King’s Arms” yard. After a few years however, they decided that they did not pay and so decided to withdraw them. Mr F. H. Sayer, one of the drivers, however, who apparently had foresight of the possibilities of motor buses in the Market Lavington district, purchased the buses from the Bath Tramways and set up on his own to run services. Sayer’s buses began to pay and early in the 1920’s a company’ was formed which called itself the Lavington & Devizes Motor Services Ltd., and by 1934 the Company had extended to 37 buses and coaches – or rather “char-a-bancs” as they were called in those days. Services were running to all the principal towns and villages in the district, including Bath, Salisbury, Trowbridge, Pewsey, Chippenham etc. About one-third of this fleet of 37 vehicles were charabancs which were only licensed during the summer months for running trips and day outings to the sea-side and places of interest. The charabancs were much different to the present day luxury coaches which carry out these trips. They were open with a canvas hood which was pulled over the seats when the weather was unkind. The seats went right across the vehicle, with a separate door to each row of seats. They had large brass head lamps lit by acetylene (later with bulbs and a battery), and up to about 1927-8 they all had solid tyres. The buses too, were very different to the present day ones which serve the village. They were very high, fitted with solid tyres, and most of them were fitted with a carrier on the back, and sometimes on the roof, for carrying large parcels and crates of poultry etc., to and from the various markets. All repairs and maintenance (body-building and painting etc) was carried on at the Company’s depot which was Oatley’s Yard and the garage now owned by Messrs. Wordleys. Wages for some time were 7/6 per week for conductors and £2.0.0 for drivers! Mr. Sayer by this time was quite a well-known figure in the district as Proprietor of the Lavington & Devizes Motor Services: also because he was an exceptionally big man – at one time his weight was Just over 32 stones! In 1934 the Lavington & Devizes Motor Services Ltd., was sold to the Bath Tramways Motor Co. Ltd., and a few years later they in turn were taken over by the Bristol Tramways & Carriage Co., but the Bath Tramways still retained their title, which still holds today. In 1935-6 great changes took place: the Company built a large new depot comprising Garage. Booking office and waiting rooms etc., at Devizes which became the company’s headquarters for the district. More modern and up-to date vehicles were operated and services on practically all roads were made more frequent. Although Devizes was made the centre for the Company’s operations Market Lavington was not entirely neglected as now a very frequent service is running between Market Lavington and Devizes, and the buses on the service are modern double-deckers. Some of these double-deckers are not much higher than some of the very early single deck buses were, especially when they had crates of livestock in the racks on the roof! Back in January we published a blog about a new car – a Ford Popular. You can click here to see that. One of our regular readers (a local man) felt we really should have a little more about that kind of car and offered us his handbook. So here it is. There’s nothing very classy about the front cover which seems to reflect the sparing use of ‘extras’ of the car itself. Inside, though, there is a photo of the car. They look very much like a pre-war car yet were made and sold as recently as 1959. In terms of them being basic, note that there is only the one windscreen wiper. The driver could see out. Any front seat passenger wouldn’t, if it rained. And actually the driver might have difficulty for a primitive wiper system meant the blades moved rapidly when the engine was hardly working, but slowed almost to a stop if it was working hard. But these were the days when people expected to do their own servicing and repairs and this little manual gave plenty of help in words and diagrams. Here we see the way the coil ignition system was assembled. An interesting little book to accompany one photo and remind us of what car ownership was like around 60 years ago. We recently came across this piece of writing by Tom Gye about the wheelwrighting shop at Gye’s depot on White Street. 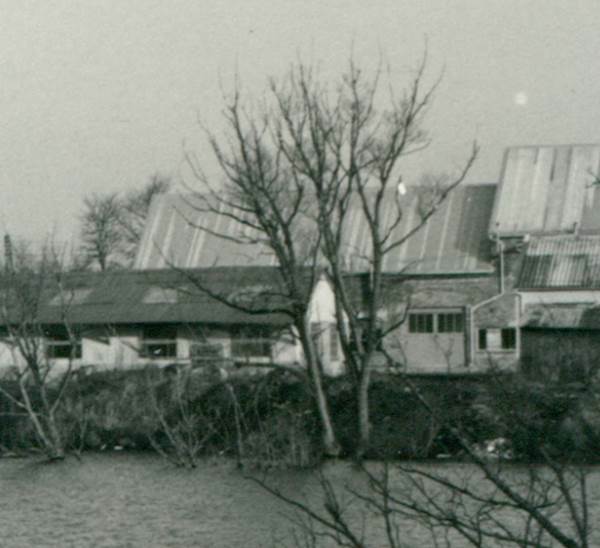 Enclosed is a shot of the old workshop on the first floor of the Barn (malthouse), taken when the last wooden wheels were made in the 1950s. The higher of the two wheels resting horizontally is supported on a section of hollow tree trunk which I suspect had been used like that for well over a hundred, maybe two hundred years. On top of the block crowning it is the end of a long rod which passed down through the hollow stump with a threaded end which engaged a ‘female‘ thread secured under the floor enabling the wheel to be held firmly in position while being worked on. Almost invisible at the rear are ‘shafts’ for horse drawn wagons which had been repaired. On the left there is a ‘tail ladder’, removable frame for attachment to a wagon bed (one at each end) to facilitate extra loading space for sheaths of corn or loads of loose hay. Near that with an axe bedded in it is the ‘chopping block’ very essential with wheelwrighting and agricultural vehicle repairs. Various items of irregular shape were roughly hewn before finishing by drawknife and spokeshave. That block, another section of tree trunk, was at least half a metre higher when first put into use. For many years the principle source of heating in the house was the fire in the kitchen range. My father was always the first downstairs and would get the kitchen range lit. As a schoolboy my job each evening was to prepare a box of kindling for that purpose, there were always offcuts of softwood from joinery jobs lying around and wood shavings produced from hand planes. I had to reduce the offcuts to kindling size by splitting them with the axe on the chopping block. Sufficient quantity would be placed in the bottom of the box and then handfuls of shavings placed on them all ready for fire lighting. If I was in a hurry to join my schoolmates with some project (probably mischievous) I would arrange the minimum of kindling wood in position to support the shavings near the top of the box making it all appear like a normal amount. Next day of course I would get my comeuppance. Our Market Lavington Market Place has changed a huge amount since the second half of the 20th century. People who didn’t know it have difficulty recognising just what was there in the older pictures. Here’s an attempt to offer help using a photo from the 1950s and another 21st century shot. One of the features of this (and no doubt other) blog platform is that you can set up picture galleries which can merge one picture into the next. So here we have a sort of simple two frame animation of the two shots. So there we have it. The Market Place in Market Lavington, then and now. The title for this piece is a quote from Joni Mitchell’s 1970 song, Big Yellow Taxi’. The song goes on, ‘They’ve paved paradise and put up a parking lot’. Joni was probably singing about an area around Honolulu but she might almost be singing about what happened in Market Lavington in around 1960. It was then that some lovely looking Tudor houses were demolished in our Market Place and replaced with – you’ve guessed it – a parking lot. On this blog we certainly wouldn’t criticise a decision made close on 60 years ago. Advantages stemmed from that decision, not least better employment prospects locally as the agricultural engineers were able to expand their much needed operations. What Market Lavington had, before the changes was this. By this stage the age of the local agricultural engineer had ended. The parking lot, in the foreground, where the bank and other buildings had stood had its lack of beauty enhanced by an old rusty van of some sort. Even the ‘parking lot’ with its displays of fine red tractors and combine harvesters might have seemed like paradise by this time. Clocks can’t be turned back but situations change and this is the 21st century view. What looked so abjectly awful in 1988 has become the front area of Rochelle Court. A new building on the corner now houses a chemists shop and the other shop window, in the white building has a flourishing shop too. That’s a florist. We have recently been given another advert from Harry Hobbs’ shop which stood more or less opposite the Green Dragon on Market Lavington High Street. This one is a metal sign on legs which could have been set in the ground or perhaps in a stand. It advertises a brand of ice cream which is not familiar to us. We understand that Harry Hobbs shut down his grocery business in about 1960 although he continued to be the newsagent for some time after that. This sign, battered as it is, probably dates from the 1950s. There is an ice cream company trading in Reading in Berkshire called Lucky Clover Leaf Ice Cream. There’s an outside chance it could be the same company but the clover leaves shown on this advert sign are clearly three leaf variants and not the supposedly lucky four leaf clover. Maybe there is somebody out there who can tell us more. Florence Cooper was known by a wide family as Granny Cooper – even to people for whom she was not, strictly, the grandmother. 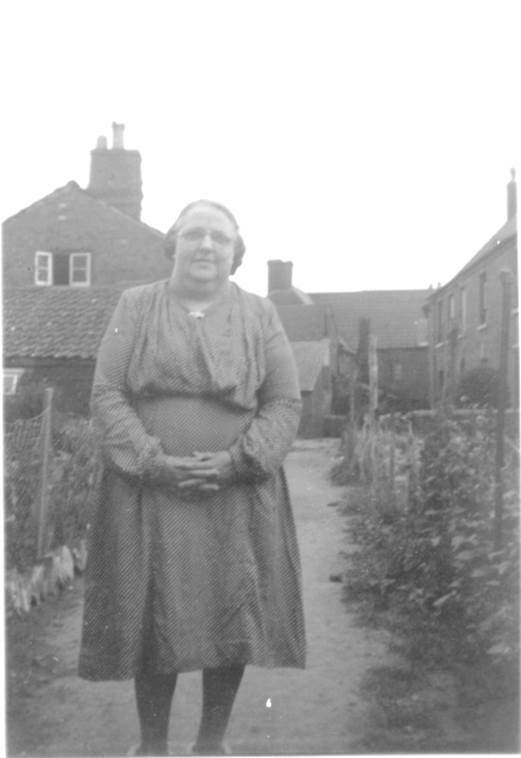 Our photo shows her near her home which was one of the old houses in the Market Place. These were demolished in the late 1950s. We think this photo was in an area which had been called St James’ Square. Possibly, the building facing us, at the back of the alley, is actually the back of the Co-op. 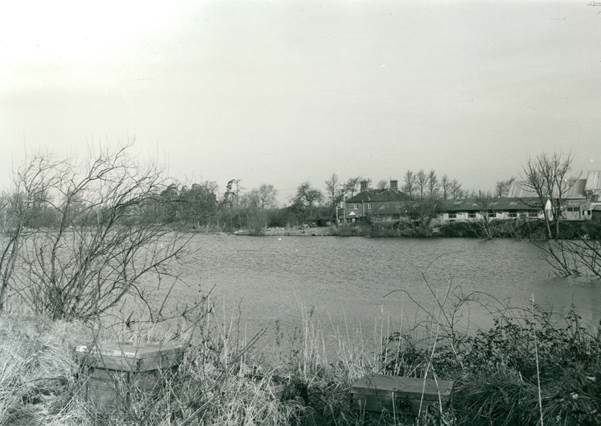 But we’d welcome further information on this for the only other picture we have which we think shows the same area is actually of the buildings being demolished. Florence was born Florence Moore in Easterton. She was the daughter of Samuel Moore of the jam factory. She had been born in 1890 and was the first born of Samuel and his first wife, Bertha. Florence married Walter Cooper in 1912. He’d have been a gardener at the time, living with parents in Northbrook. We can see that the couple lived at Market Place in the various electoral rolls we have for the 1920s and 30s. Walter died in 1948. Florence followed him in 1966. There’s nothing like a day out in town – particularly one by the seaside – when you are a young man. There’s the chance to show off and impress the local young ladies – who may also be visitors seeking a bit of fun. 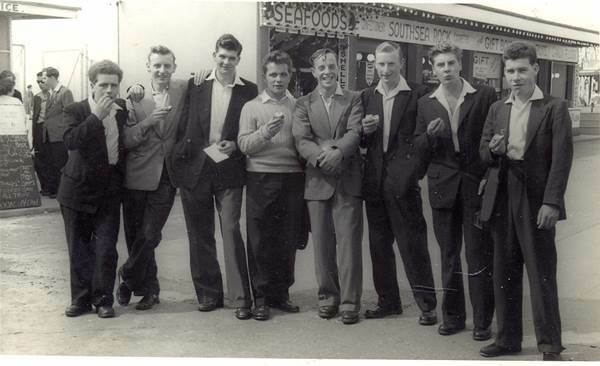 This group of Lavington lads were able to line up for a photo at Southsea on a day out and here they are. They are dressed for the occasion, mostly in suits or jacket and trousers. The shirt collar is open in every case. A tie would have been too formal. The shirt collar is worn outside the jacket one. Trousers are quite baggy and long enough to break over the polished shoes. The photo must date from quite early in the 1950s when days out like this were a rare treat. We wonder what memories the lads brought home. Let’s hope they had a good time. Many people, these days, will not realise that Market Lavington once had a brick works. Actually, buildings still survive from the old works and still find industrial and residential use down at Broadway. But the pit where clay was dug has vanished entirely, filled with refuse and then surfaced. If you know where Mike Garbutt keeps his lorries you have about the right place. This was the scene after the brick works closed. It looks like a peaceful, rural lake and is quite substantial in size. This was where clay was dug to make Lavington bricks. 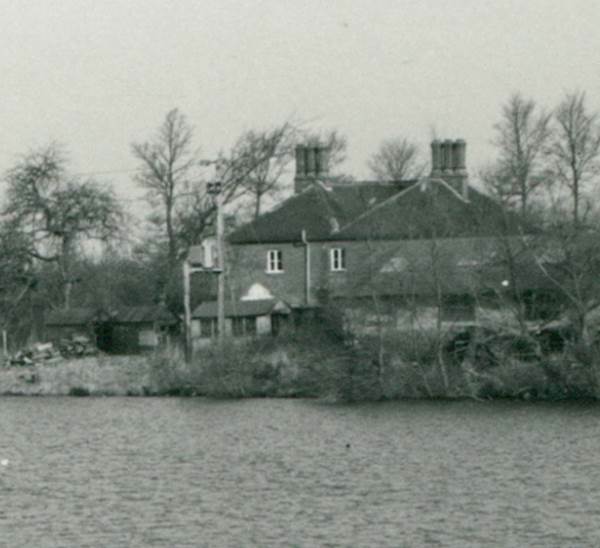 In the background we can see the brick master’s house, built by William Box. And next to that the high roof behind the sheds still exists as well.